Year of Birth: July 19, 1956. 1986 took Ph.D in Law. Speciality - Finance & tax law. (Saratov State Legal Academy ). 1983-1986 Post graduate student. Voronezh State University. 1973-1979 student of the Law School of the Voronezh State University. 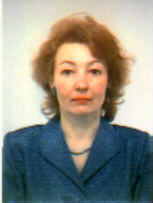 1986-1992 assistant professor of the Voronezh State University. 1982-1893 Voronezh Regional Department of justice. Inspector. 1979-1882 Kursk Regional Bar Assosiation. Attorney. 1991 I took part in summer session of the Hague Academy of International Law ( Holland). Certificate was received. 09.1994-06.1995 I partook in JFDP(USA). 09.1995-up to date I am a member of the scientific council of the State Institute of the regional legislation. 09.1997 I am a member of the Dissertation Council in the financial law area of the Saratov State Legal Academy. 09.1999 I am a member of the Dissertation Council in the financial law area of the Russian Legal Academy ( Ministry of Justice). On the results of scientific work 2 monographs, 5 textbooks,31 articles and 3 collections were published. Karasseva M.V. Financial law .General cours.Moscow, 1999. Karasseva M.V. Financial legal relationship.Voronezh, 1997. Karasseva M.V. Constitution right of Soviet Citizents to complain. Voronezh,1989.